By Caz | November 11, 2018 | This post may contain affiliate links, which means we may receive a small commission, at no cost to you, if you make a purchase through a link. Read our Disclosure. 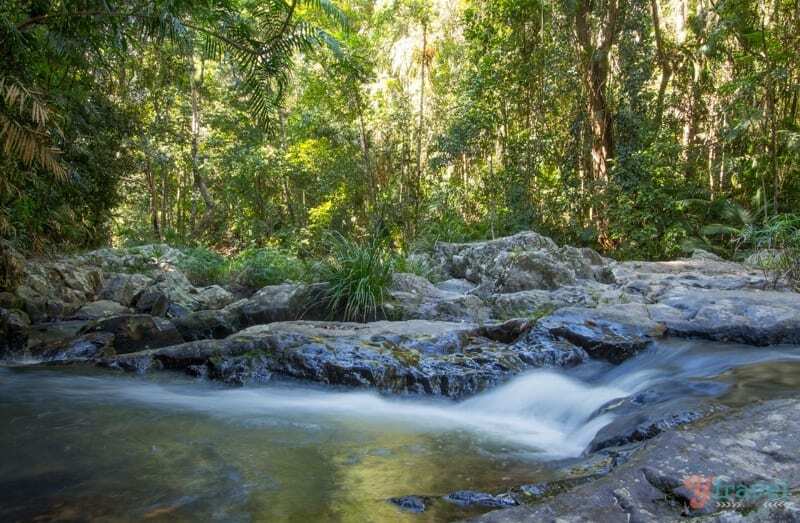 The recommendations came in quickly when we asked our community about things to do in Cairns. 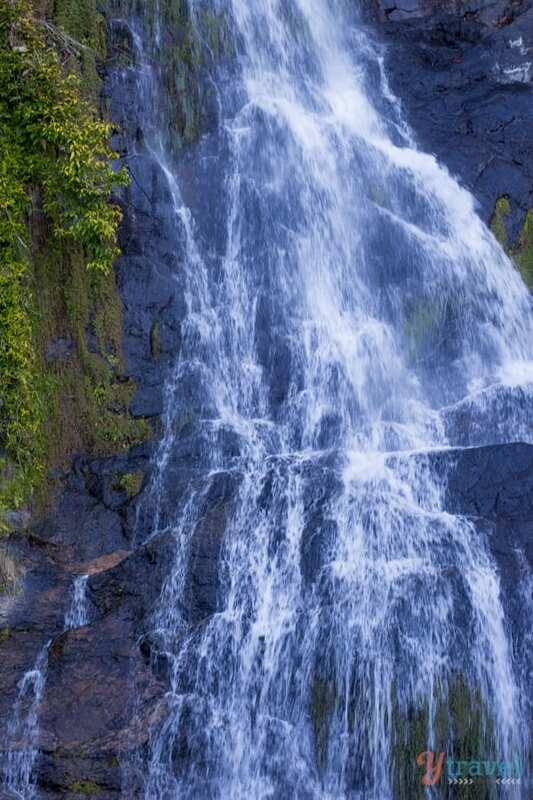 Visit the town of Kuranda in the Atherton Tablelands was on the list. To get there you suggested we go up the mountain on the Kuranda Skyrail Rainforest Cableway, and then come back down on the Kuranda Scenic Railway. You can do it the other way around, but the thinking behind this strategy was three-year-old Savannah would fall to sleep on the way down to the rocking of the old Kuranda train. Sounds good in theory, but she’s a stubborn one our little girl. She didn’t sleep a wink and probably a good thing for her as she would have missed half the fun and half the scenery. 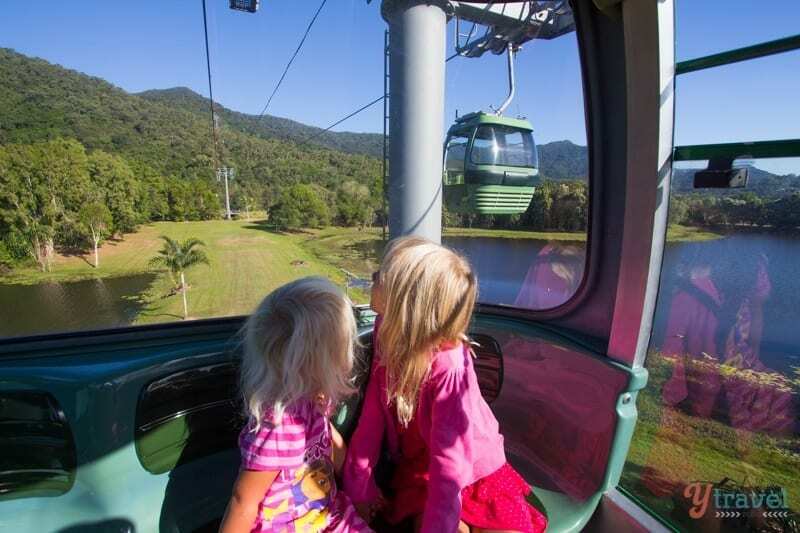 The Kuranda Skyrail was opened in August 1995, and at the time was the longest gondola cableway in the world. There’s quite the story behind its construction. Due to it operating above a World Heritage protected national park, there was no access to the forest by road to build the towers supporting the cableway. Construction workers and engineers had to hike in and out each day wearing protective gear over their shoes so they did not damage such a divine environment. The material for the towers had to be dropped in piece by piece by helicopters! 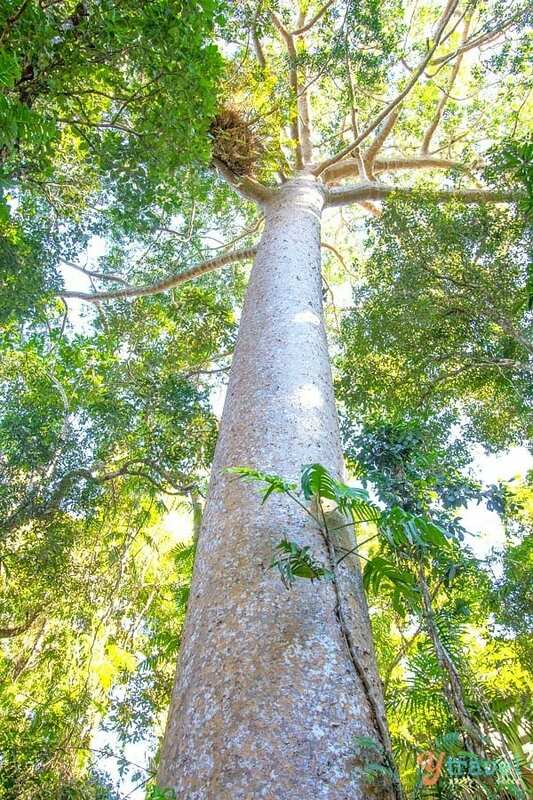 So you can rest assured that no part of the Wet Tropics World Heritage Rainforest was hurt in the process. 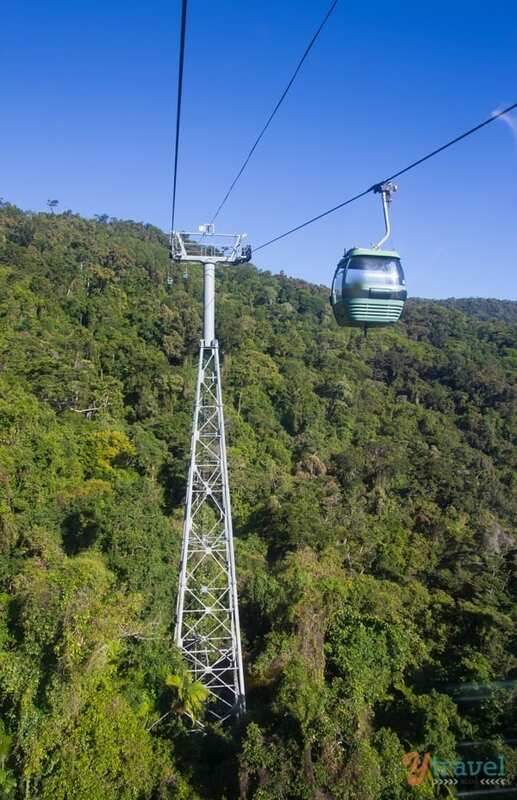 As a result, we now get to sit in a gondola and glide for 7.5 km over the top of pristine rainforest for a deeper look at this fascinating part of the world. 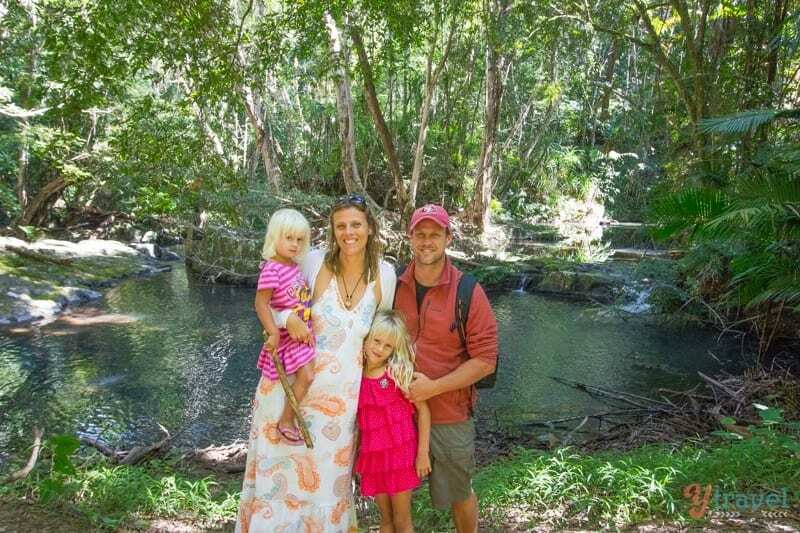 Tropical North Queensland is one of my favorite regions of Australia. The views out to Cairns and the lush rainforest of the Tableland Valley were impressive. 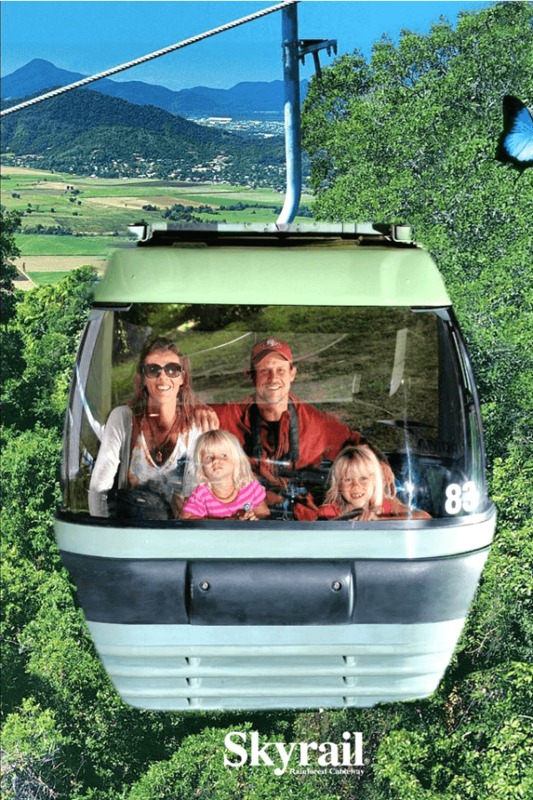 We were in the Diamond View Gondola (extra $15 adult, $7.50 child). 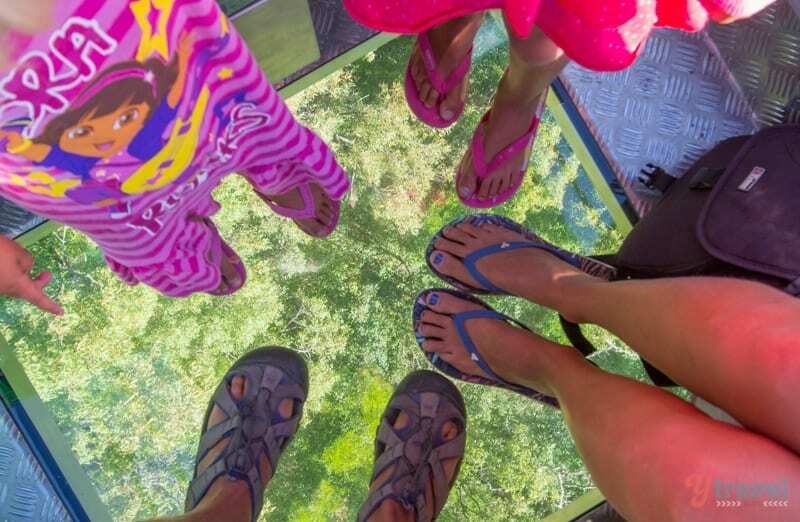 If your nerves are up to it you have a glass bottom floor, and beautiful views down to the varying vibrant shades of green of the canopy in varying vibrant shades of green. When a space in the thick foliage opened up we could even peek way down the bottom layer ferns scrambling for the sunlight. We of course, had to do the obligatory foot shot on the glass floor. 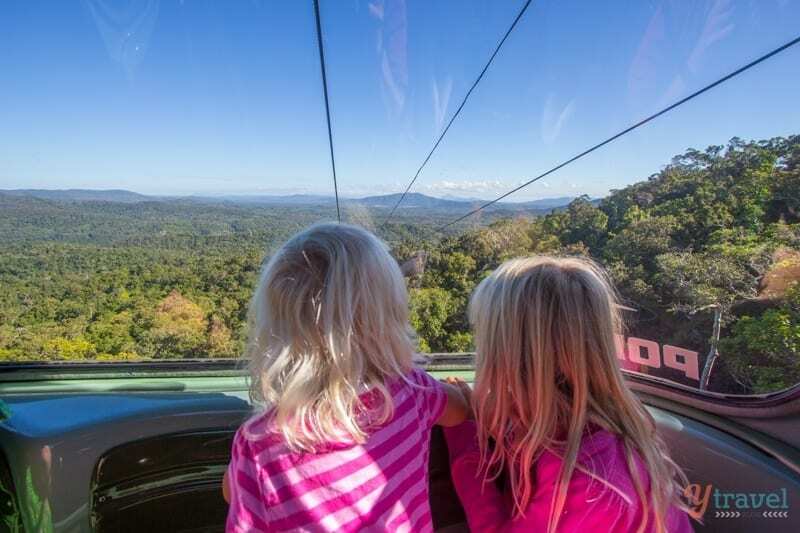 The Kuranda Skyrail cableway experience takes about 1.5 hours one way, which includes two stopovers along the way. 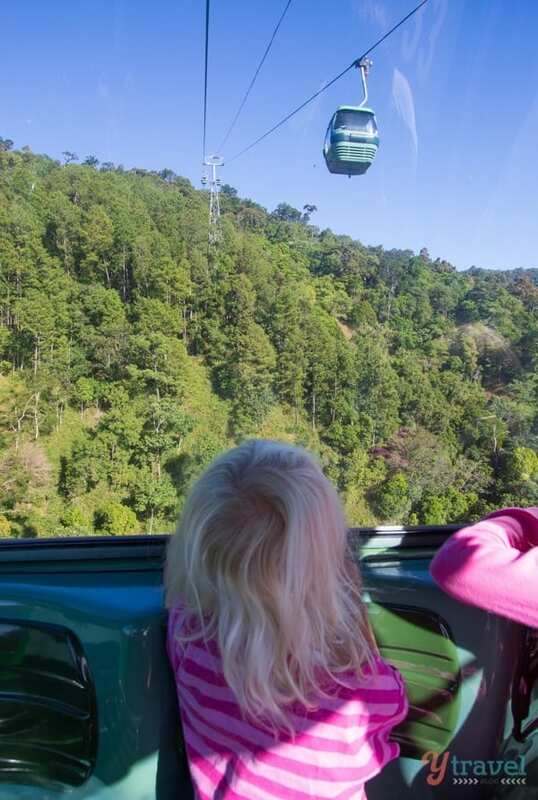 At the first stop, the gondola descends into the rainforest canopy at Red Peak. There is a short boardwalk through the rainforest. Check for times for free ranger guided tours so you can learn a little more about the flora and fauna of the area. I loved seeing the big kauri trees. Coming into Barron Falls Station you will get glimpses of Barron Falls Gorge. 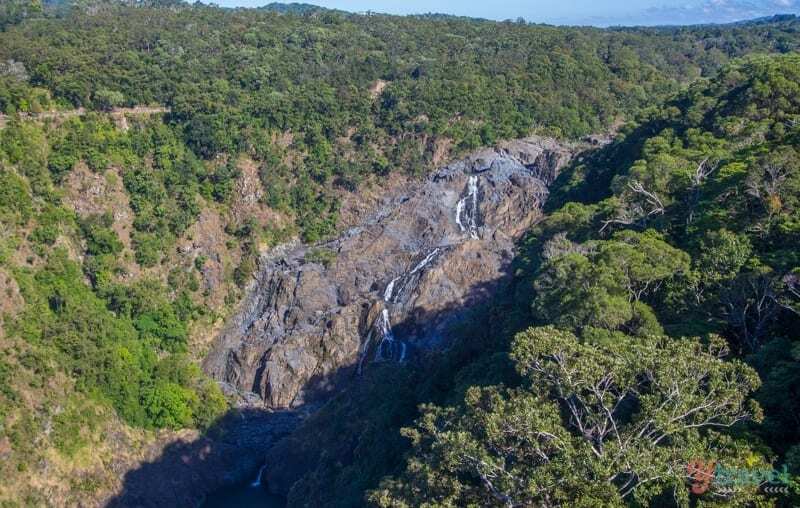 Hop off and spend time soaking up the views of Barron Falls. 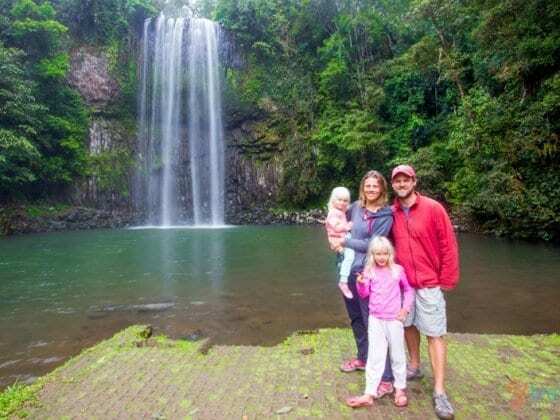 Even though we visited at a time when the water level was not high, it was impressive to imagine what it must be like in full flow during the wet season. There’s a bit of history in the area left over from the hydroelectric days. Walk along the path to check out the old flying fox used to transport people and goods across the gorge during the construction of power station. 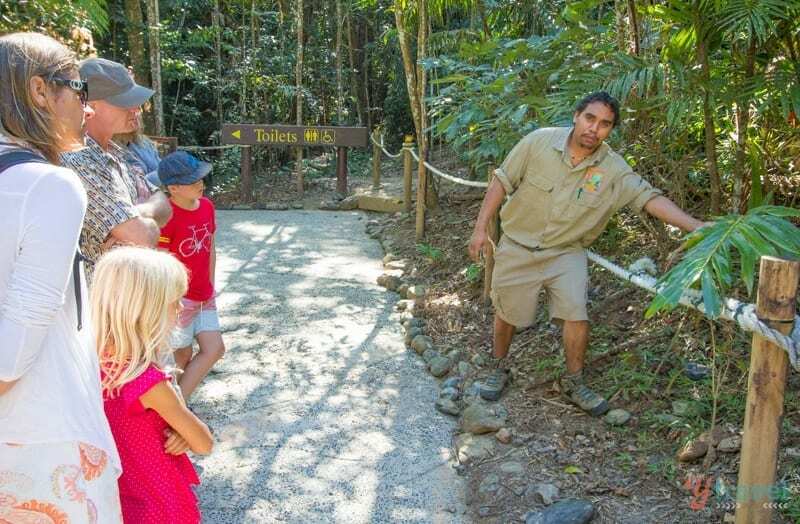 There is a rainforest interpretation centre, which is good for the kids to learn a little more about why this is such a special and protected area. Be aware of any roaming cassowaries, which are frequently spotted in the area. 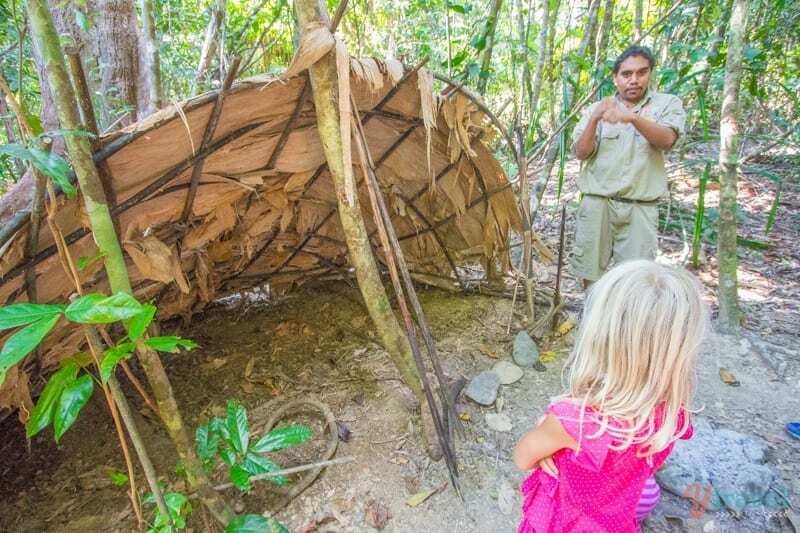 The Djabugay tribe are the traditional owners of the rainforest area and the 40 minute guided tour gives a fascinating insight into their culture, their language, stories and how they lived with the land. You’ll be amazed at how much food is readily available in the rainforest and why we don’t eat it. Even more amazing is how they found ways to make the poisonous foods safe for eating. 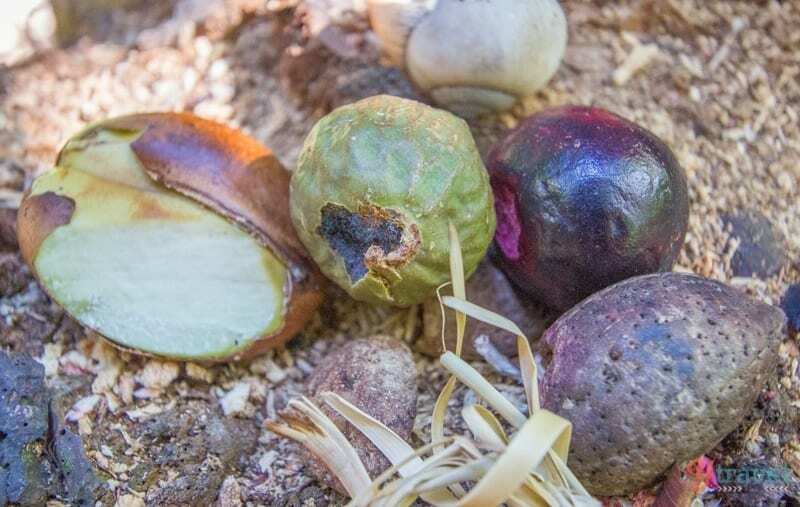 Not all though – don’t eat the bright red berries in the wild in Australia. Bright red is the colour for poison! 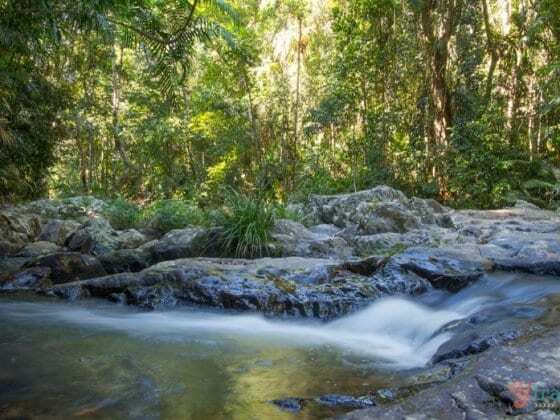 You’ll walk through the rainforest down to a small billabong and river. We especially loved the sharing of a few dreamtime stories down by the waterhole – the one about the water fairies wowed the girls. I couldn’t help but peek behind the fern trees to try and find them too. I loved when our guide spoke about how so many of their beliefs and creation stories and similar to those around the world, proving that we all come from the one source. How else would we think and believe in the same way? This is the truth my travel experiences have shown me and I loved this inherent wisdom of his people sharing the same. 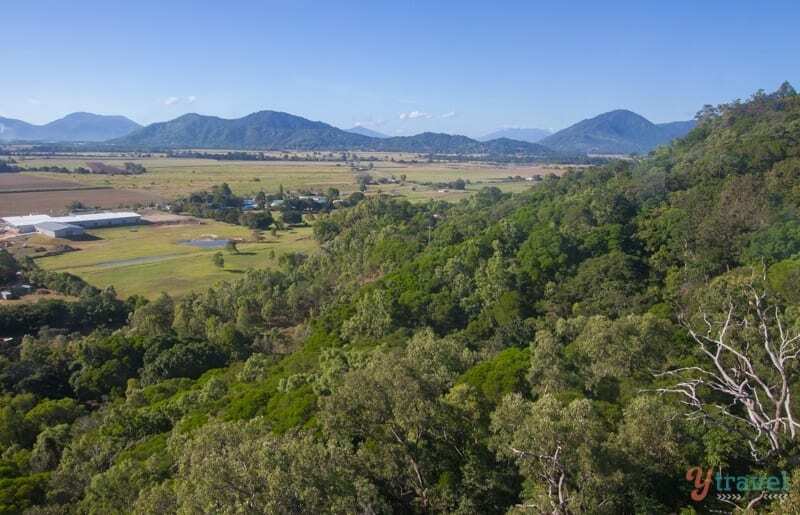 Kuranda is a quaint hinterland village, often referred to as the hippyville of the Atherton Tablelands. Although don’t be expect the markets to be anything like Byron Bay or Bellingen. 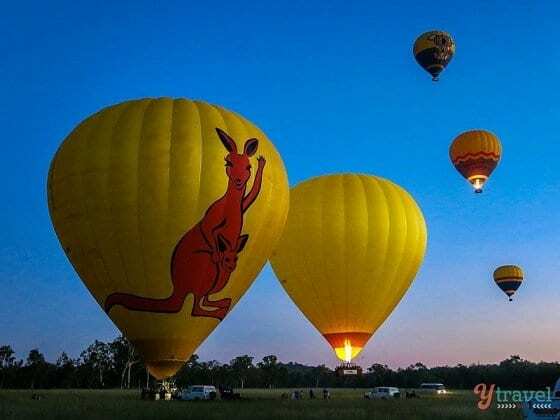 There’s not a lot to see and do although plenty of the people in our community raved about the Koala Gardens, Australian Butterfly Sanctuary, and Birdworld. At this stage, we were getting a little wildlifed out. So we passed. There are a few market areas, and again, due to being kinda marketed out, we weren’t that overly enthusiastic about them. 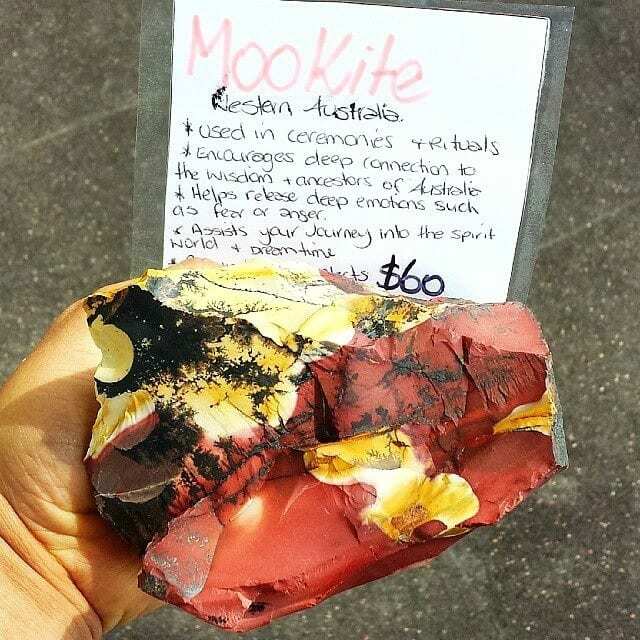 But, I did find (or it chose me) the most divine mookite crystal from Western Australia. How could you not be drawn to the patterns and colours in this rock? It came right in the midst of my complete awe and fascination with the Aboriginal way of life and wisdom so I just had to buy it. It’s a sacred rock that was used by the aboriginal tribes in special ceremonies to connect with the Dreamtime and spirit world. I also read online that it helps reduce the signs of aging! Vanity comes racing in! It sits by my bed every evening to work its magic! We decided to walk back to Kuranda Railway station for our return trip home via the 3 km rainforest walk. This was a beautiful board walk, my favourite part was the final stretch along the esplanade and river. There was the most divine afternoon light which was dappled amongst the melaleuca trees and along the river bank. We even saw a crocodile swimming on by (a freshie!) It was so serene. Except it wasn’t as our timing was off so we had to speed walk along here to get to the train. I was most disappointed as I could have chilled there with that energy for some time. So give yourself time to explore this walk. 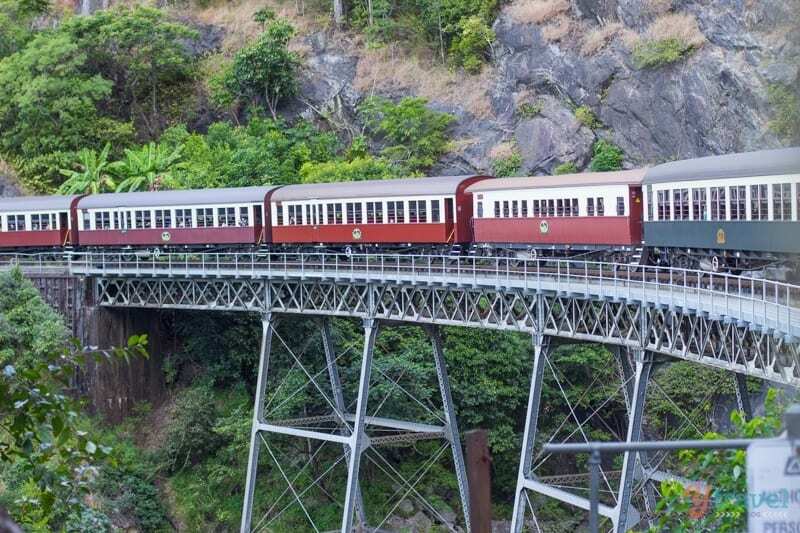 If you’re into train journeys, great engineering feats and history then you’ll love riding the Kuranda Scenic Railway as it winds down along the McDonald ranges heading back into Cairns. I don’t know much about engineering – nor am I interested – but I was pretty impressed. 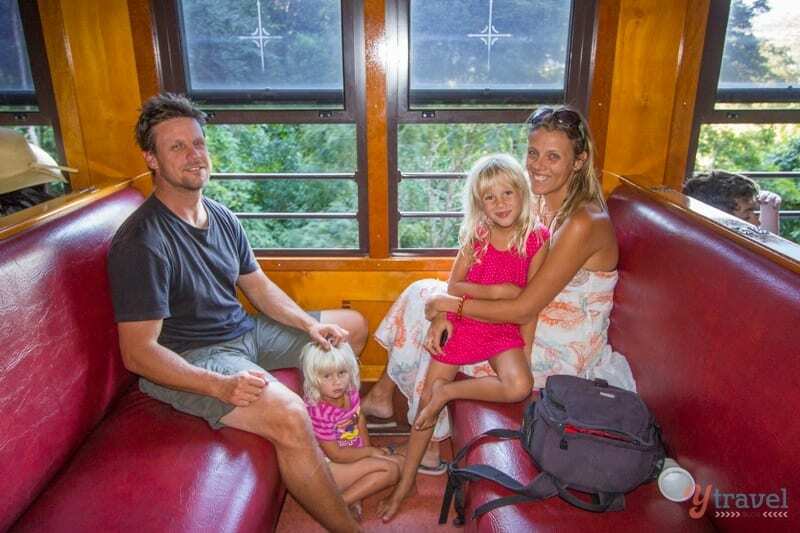 The Kuranda Scenic Railway stands as a monument to the pioneers. 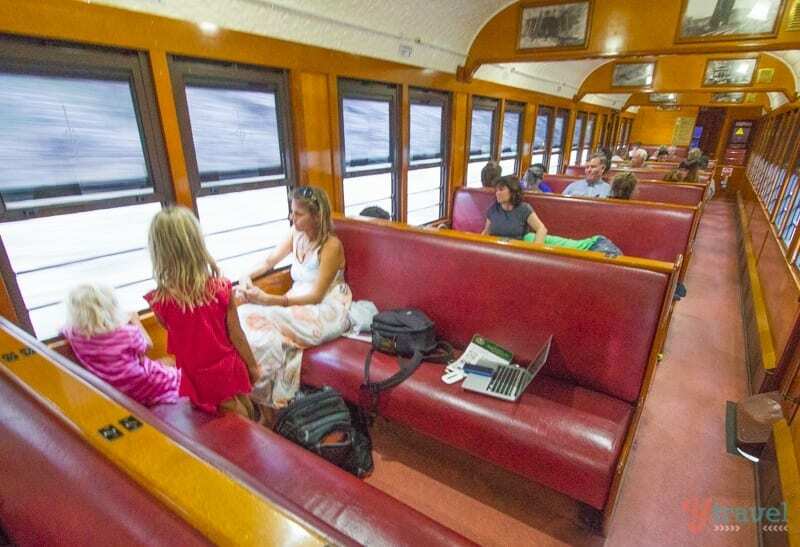 This famous railway winds its way on a journey of approximately 1 hour 45 minutes between Cairns and Kuranda. Commentary explaining the railways construction, the history of the railways, and the tropical rainforest is given throughout the ride. It was a pretty journey through the rainforest over bridges and through tunnels hand-made by North Queensland’s pioneers over 100 years ago. We passed a couple of waterfalls tumbling into deep ravines, and stopped to see Barron Falls. I think the view from the Skyrail side was better. Splurging for a gold class seat on the train (extra $48 per person) would be a great option if this was a high on your bucket list thing to do. It includes food and alcohol. Yep. good train journeys go well with a glass of shiraz. If you choose to experience both the Skyrail and Scenic Railway on the one day, you will need to get bus transfers at the end of it from Freshwater Statin to return to your car. Unless you can arrange for someone else to pick you up. Transfers are $18 per person. Or you can purchase transfers there and back from your accommodation. Grab your combination ticket with hotel transfers here. My favorite Queensland beaches you should set foot on. RentalCars.com is the world’s biggest car rental booking service that compares all the major brands like Hertz, Avis, Alamo, and Europcar. Outdoorsy also does campervan rentals. This brings back good memories from childhood holidays in Cairns! I also find it interesting how stories and symbolism are so similar across completely different cultures around the world. It sounds like you might enjoy the book “Ariadne’s Clue” which is all about evolutionary psychology and how it relates to myths, symbolism and culture. Amazing views you guys have there. And that fall is so beautiful. Ah, good to read this. We didn’t do this trip on the Cairns/PD visit in last school holidays but I’ll definitely do it next time we are up there. Did you see the SBS show First Contact at all? It’s fab and well worth a watch online if you missed it – a huge range of emotions watching that. Made me realise that so many Aussies never travel in their own backyard… so glad for my expeditions around OZ as a backpacker and my trips now. Wonderful views and awesome travel. I thought the waterfall view from skyrail can invite anyone in the world their.